Rent Courtyard Marriott Houston Brookhollow | Corporate Events | Wedding Locations, Event Spaces and Party Venues. The new state-of-the-art lobby at Courtyard by Marriott Houston Brookhollow provides flexibility and choices for our guests. We offer a new lobby with inviting spaces to work or relax in, complimentary Wi-Fi and easy access to the latest news, weather and airport conditions via our GoBoard. Eating space meets meeting space at The Bistro - Eat. Drink. Connect; with a variety of fresh, made-to-order breakfast, dinner, and beverage selections, including 24-Hour Starbucks coffee and specialty beverages. Recharge in our Fitness Room and tropical outdoor pool & patio. The Business Center and The Market are available 24 hours. We are conveniently located to easily reach all Houston has to offer, including The Galleria and Downtown Houston. Nearby local company offices such as Weatherford, Baker Hughes, Reynolds & Reynolds, Xerox, Pitney Bowes, Siemens, Oceaneering, Cameron, Air Liquide, ExxonMobil, Stewart & Stevenson, Tarkett. Plan intimate meetings and events in our 468-square-foot Houston meeting room. 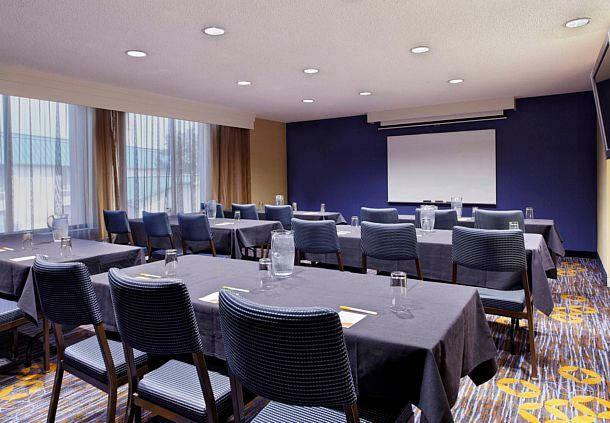 Our Houston conference facility can accommodate up to 18 classroom-style and 30 theater-style. Make use of high-speed wireless Internet and catering for breakfast, coffee breaks, and lunch. This Houston hotel is near Brown Convention Center and a host of area convention centers and venues. Relax after a long day in refreshing, renovated guest rooms. Rely on us for your next special event with flexible meeting space and excellent service. Free High-speed internet in all rooms and throughout the hotel.